Ya’ll, some serious Spring Cleaning is happening over here. Last weekend I tore through my closets and dressers and filled 3 trash bags full of clothes, shoes, and accessories. More on that later. Today, I tackled my nail polish. 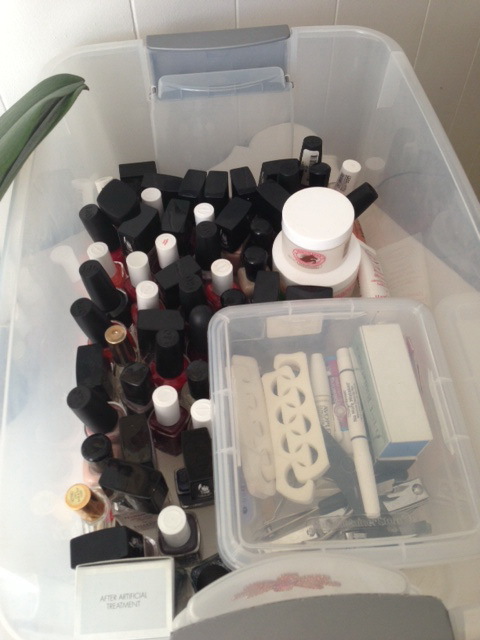 I had nail polish and nail tools in every room of my apartment!! And because I am spring cleaning right now I had an extra plastic container that was going to be perfect for the nail polish round up! It’s startling to wrangle everything into one place and come to terms with the fact that you might have a polish addiction. I cleaned and sterilized all my tools (hot water and anti-bacterial soap), tossed the tools that were dull or starting to rust. Then I wondered why I had 6 pairs of nail clippers, one of which was for a baby’s nails….I don’t have babies. After I corralled everything having to do with nail care (polish, tools, cuticle creams/oils, decals etc) and made a place under my bathroom sink. I decided to hit Pinterest to see what everyone else was doing these days. I saw everything from using over-the-door shoe organizers to displaying the polishes on wall shelves to lining them in drawers. Although I like the thought of being able to readily see all the different colors, I have limited space so using the tub allowed me to have everything together and reuse a container that almost got thrown out since I couldn’t find the lid. 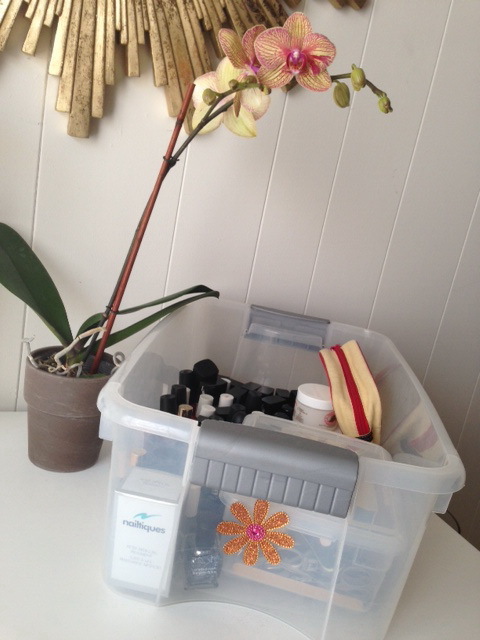 How do you keep your polishes organized? Share ideas and pictures in the comment section below. P.S. Do you have a favorite brand or color?? Do tell!! You haz butter polishes? I love butter! Jeessss I haz me some Butter polish. It's me favorite. For realz!